Sunseeker International is looking forward to treating visitors to the best of British at this year’s Cannes Yachting Festival. 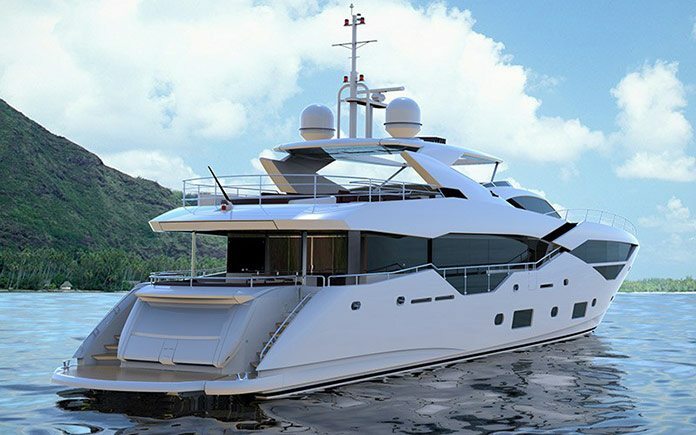 Eight of the brand’s luxury performance motor yachts will be on display and the show will also see Sunseeker mark an important milestone for the brand. The highly popular Predator 57 will be making its show debut on the Sunseeker stand and visitors will have the opportunity to explore this and other models from across the range, including the versatile and elegant Manhattan 55, the powerful 115 Sport Yacht and the sublimely stylish 86 Yacht. Visitors will also be able to learn more about three exciting new models set for launch in early 2016 – the 131 Yacht, 116 Yacht and 95 Yacht. Sunseeker’s highlight of the show will be marking the delivery of its 100th luxury performance yacht in the 100ft+ “superyacht” category. Owners and special guests from across the globe will attend a VIP champagne breakfast event on the 9th of September to celebrate this achievement which signals a true coming of age for this iconic British brand. The launch of Sunseeker’s first 100ft+ model, the 105 Yacht in the summer of 2000, was the initial step in the brand’s progress towards becoming a major player in the superyacht sector. Since then, Sunseeker’s 100ft+ offering has rapidly evolved and now extends from the sleek and powerful 101 Sport Yacht to the majestic flagship 155 Yacht, with a diverse range of options in between. Sunseeker is constantly setting new standards and benchmarks across its entire range. With the arrival of new CEO Phil Popham earlier this year, and the strong financial backing and support of its strategic shareholder Wanda Group, the company has ambitious plans to strengthen its position as the number one global brand for luxury performance motor yachts. The company currently builds more boats 80ft and above per year than any other brand. To build on this dominance, it places a clear focus on innovation through an extensive new product development programme aligned to world class manufacturing and support services across the business.